Your request has been submitted. We will get back to you as soon as possible. Q: What is a Registered Dental Hygienist? A: While we tend to wear many hats, foremost and importantly we are your front line dental professionals in preventative oral care and have the training and specialized skill set to scale and polish the teeth, apply fluoride and desensitizing agents, and are trained in the placement of pit and fissure sealants. We very much enjoy educating patients on oral hygiene instruction and can provide recommendations for diet and smoking cessation, where necessary, to improve your overall health. We provide a variety of oral care assessments such as intra and extra oral examinations, periodontal assessments and a complementary oral cancer screening at every visit. We work collaboratively with you and other health care professionals to help you achieve and maintain optimal oral health for total body health and wellness. Our profession is licensed and regulated by the New Brunswick College of Dental Hygienists. Q: What is an independent dental hygiene clinic? A: This concept of being seen at an independent dental hygiene clinic as opposed to having your hygiene needs met at the general dentist's office is fairly novel. On June 19, 2009, An Act Respecting the New Brunswick College of Dental Hygienists received Royal Assent in the NB legislature after 13 years of lobbying with government. Thanks to changes in the provincial legislation dental hygienists with the appropriate education, training and certification may practice outside the traditional dental office setting. This gives those seeking dental care more choices. Q: Why would I choose an Independent Clinic? A: The service! We dedicate an hour to each of our patients, and work to make sure your visit is as stress-free as possible. NO DRILLS + NO NEEDLES = NO ANXIETY. This is one reason we do what we do! We see a lot of patients that have varying degrees of dental fear, mostly from past experience. 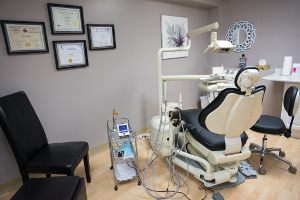 At Dynamic Dental Hygiene Clinic we strive to provide you with an environment that is more relaxing, welcoming and affordable, making it an all-around more enjoyable experience! We also work outside of normal dental office hours making it more convenient for you to visit at a time that is right for you. You can choose your Dental Hygienist and your Dentist. You are not limited to the dental staff at your dentist's office. Just like you choose who you want to fill your cavities you can choose who you want to clean your teeth as well! We also have a mobile clinic, more about that later! Q: Will my insurance cover my cleanings the same as at the dentist’s office? A: Yes, the process is the same as at your dentist's office. Most insurance claims can be submitted electronically, while others may be mailed directly to the insurance company. Dental Hygienists have their own set of codes set by the Canadian Dental Hygienists Association and are associated with the treatment provided. Q: What is mobile dental hygiene? A: Dynamic Dental Hygiene Clinic brings the cleaning to you! Mobile service makes getting your teeth cleaned easier than ever, even in the comfort of your own home! 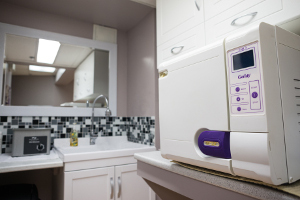 Utilizing our self-contained mobile dental hygiene unit, your loved ones will be able to experience a regular dental cleaning in a nursing home, special care home or just simply in the comfort of their own home. This is a great alternative if you or your loved ones require dental hygiene care, but have mobility issues and cannot get out for regular dental cleanings or check-ups. Q: Do you offer any special discounts? A: We do! If you are a student or someone living in a nursing or special care home, please advise us when booking your appointment. A: Gingivitis is an inflammatory condition affecting the gums. The gums may appear swollen or inflamed, red in colour and bleed easily. With good brushing and flossing habits studies have shown that gingivitis can be reversed in as little as two weeks. A. Periodontal disease or gum disease is a chronic infection of the gums and their surrounding supporting structures. This is most often due to a buildup of plaque under the gums. Periodontal disease (gum disease) is usually well advanced before a patient can detect any symptoms. It is an infection that can wreak havoc on your teeth and medical evidence reveals it also has an adverse effect on your overall health. Q: What happens if I need a tooth fixed or filled? 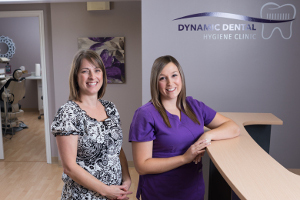 A: At Dynamic Dental Hygiene Clinic we strive to provide our patients with optimal oral health and wellness. If the initial assessment warrants the attention of another health care professional the appropriate referral will be made. We recommend seeing your dentist on an annual basis or as required. Q: I have dentures, do I still need to see a dental hygienist? A: YES! Even though you don't have any natural teeth, dentures require just as much care! We perform an oral cancer screening examination to ensure your mouth remains free of abnormalities. We usually recommend removing your dentures at night while you sleep to let the tissue breath and have a break from being covered up all day. This will keep the tissues in your mouth healthy. Also, dentures should be cleaned daily to keep them free of food debris, stain, plaque (soft deposits) and calculus (hard deposits). They should be brushed with a denture specific toothpaste such as Polident or a non-abrasive paste to keep the dentures from being scratched. Q: Is activated charcoal toothpaste good for my teeth? A: We do not recommend brushing your teeth with activated charcoal as some research indicates that it can be quite abrasive and over time make the teeth appear more dull and sensitive. Q: Is using a hard toothbrush ok? A: Only if you want to scrub around your toilet! All joking aside, we do not suggest using anything besides a soft or extra soft toothbrush for cleaning your teeth. The harder toothbrush bristles can wear away the enamel surface faster and receding gums is a common dental problem in patients who brush their teeth too vigorously. The irritation caused by this action can lead to inflammation in the gums and shrinkage of the gum tissue. Q: What is an oral cancer screening exam? A: An oral cancer screening exam is a complimentary examination at Dynamic Dental Hygiene Clinic. This is an examination of both hard and soft tissues of the head and neck to determine whether any anomalies exist. With palpation and visual inspection we check the lips, tongue, cheeks, cervical chain on both sides of the neck, thyroid, swallowing and jaw joints. Early detection is key and a visit to your dental professional can be your best defense against oral cancer. According to Dental Hygiene Canada the fastest growing new oral cancer cases are in a younger, sexually active males or females who often do not smoke or have any of the typical risk factors. Check your mouth at least once a month and know what is normal. If you notice a sore that does not heal in a two week time period, it's time to get it checked by your dental professional. Q: What about my dentist? I feel like I'm cheating on them! A: We work closely with numerous dentists in Fredericton and the surrounding area to ensure you are receiving optimal oral healthcare. If you are happy with your current dentist we want you to continue to see them on a regular basis for checkups and radiographs, but you do not have to be limited to the staff at your dentist’s office for your dental cleaning, whitening, or sealant appointments. Maybe you like to have your cleaning done a little more often but don't necessarily want the full check up by the dentist at the time, you may opt for a cleaning to keep your pearly whites feeling fresh while you wait for your regular checkup with them. If you currently don't have a dentist or are thinking about switching to someone new we can help! We make referrals on a regular basis to ensure your oral care needs are being met at a high standard of care. Q: What are sealants and are they only for kids? A: A sealant is a preventative dental treatment where a specific dental material is placed in the deep grooves of the molar and premolar teeth. The sealant is a protective barrier against cavities, it essentially "seals" out any food and plaque debris. Sealants can last several years before reapplication is needed. Although children should get sealants on their permanent molars and premolars as soon as these teeth come in, adults without decay or fillings in their molars can also benefit from sealants. A: Whitening toothpastes may be beneficial for removing surface stains (extrinsic stains) but these toothpastes can be more abrasive on the protective enamel surface of the teeth. Long-term use of whitening toothpastes may actually make the teeth appear duller due to the enamel surface being warn away and can also cause tooth sensitivity. Whitening toothpastes may lighten your smile by one shade, however an in-office safe and professional whitening treatment can make your teeth two to eight shades lighter in one twenty minute session with no sensitivity. We caution our patients on the use of these abrasive agents, chemicals and enzymes to remove surface stains from teeth. This is definitely an area where we can help you choose products which will have a greater benefit for you long-term. Q: I have dental anxiety and haven't been in years, can you help? A: NO DRILLS + NO NEEDLES = NO ANXIETY. This is a big reason why we do what we do! We see a lot of patients that have varying degrees of dental anxieties, mostly from past experience. At Dynamic Dental Hygiene Clinic we strive to provide you with an environment that is a more relaxing, welcoming and affordable, making it an all-round more enjoyable experience! Q: I only drink diet pop, is this ok? A: It's not just about sugar - acidic drinks, regular pop and diet varieties are loaded with acid! Acidity in soft drinks takes a more direct route than sugar, eroding your teeth without the help of bacteria that is already present in your mouth! With each sip your teeth are under an acid attack. Each attack of the teeth lasts about 20 minutes and when you take another sip, it starts all over again! This is why diet and “sugar-free” pop do just as much damage as regular pop. Q: How early should I have my child's teeth checked? A: You should have your child's teeth checked as early as six months after the first tooth erupts. Good oral habits start early and with regular trips to your dental professional it can become routine and an easier transition as your child grows. By introducing your child to the dental office at an early age accomplishes a few things. First, it familiarizes your child with the staff and the office environment in a non-threatening way, thus building trust. Second, it introduces him (and you) to the specific language that the office uses to take away the fear often associated with dental items. Taking good care of your child's baby teeth play an important role in helping your child bite and chew food, and learn to speak clearly.